Food makes me happy! Luckily, not in a “I am only happy when I am eating” sort of way, but in a “let’s savor every bite of this amazing creation” kind of way. I love to try new things and definitely have my old favorites as well. Food is one of the reasons why I love traveling so much and a big reason why I love cruising. My family recently went on a Caribbean cruise with Holland America. We tried most of the different options for dining, including the Lido Restaurant for breakfast and lunch most days, the Terrace Grill for chillin by the pool, and the Pinnacle Grill one night for dinner. 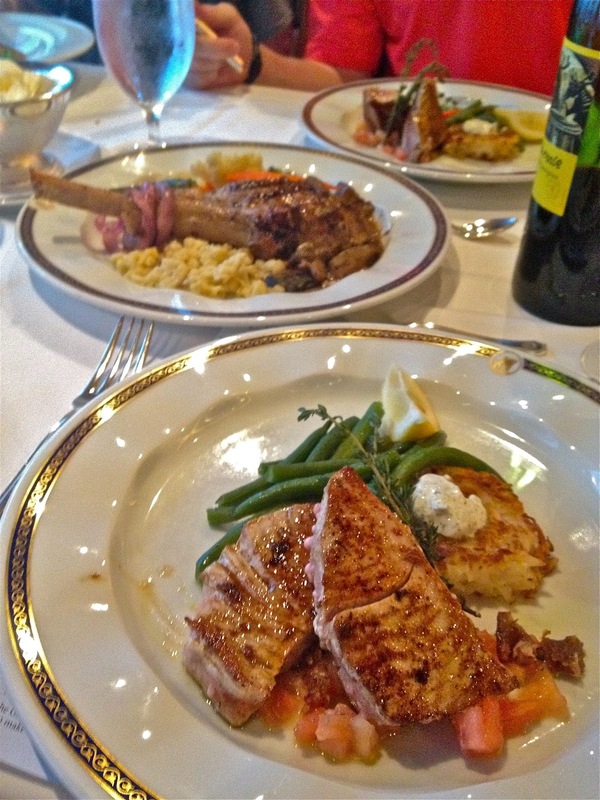 But mostly we ate at the Main Dining Room called the Vista Dining Room on the ship we were on (Noordam). I am into the “experience” of eating. I like to get dressed up and to see my family all dressed up. We always sit in the same place (at the back with a water view). We enjoy having the same wait staff every night and the fact that they call us by name. And of course, we enjoy the food. I have a teenage son who eats and eats and eats (yet stays super thin: I can only dream)! He was ecstatic to go to dinner every night. When he found out that he could order whatever he wanted and as much of it as he wanted, he was in heaven. I loved watching him pick from the menu. Every night, we all had (at least) one appetizer, one entree and one dessert. I say at least because some nights we added a soup or salad to that and some nights we had more than one course of something: meaning two desserts or like the second picture above, two entrees. I’m sorry, but I just couldn’t decide, so my waiter brought me both! There is a fitness center on board that I took full advantage of. I only gained two pounds on the trip, which I quickly lost once we got home. So it’s all good. My husband and daughter sat on one side of the table and my son and I on the other side. They were the healthy side, while we were the gluttons. You can see above, she started every meal with some sort of fruit appetizer. She LOVES fruit and it is always on the menu. Also on the menu every night was a fruit crisp for dessert. We got, at least, one of those each night. The favorite was strawberry. Yummy! More of our gluttony on display! We have a family tradition at restaurants, where we try everyone’s food and rank them in order of best to worst. It is fun and a great way to get to try everything. The kids always want to get the most votes. I told them they didn’t cook it, they just ordered it, so don’t be upset if someone doesn’t like it best. 🙂 On the really small appetizers, below, they have to take little bitty bites or I get mad. Hey, three big bites of that and it’s all gone. Two things we tried this trip for the first time: breakfast in the main dining room and getting a wine service. 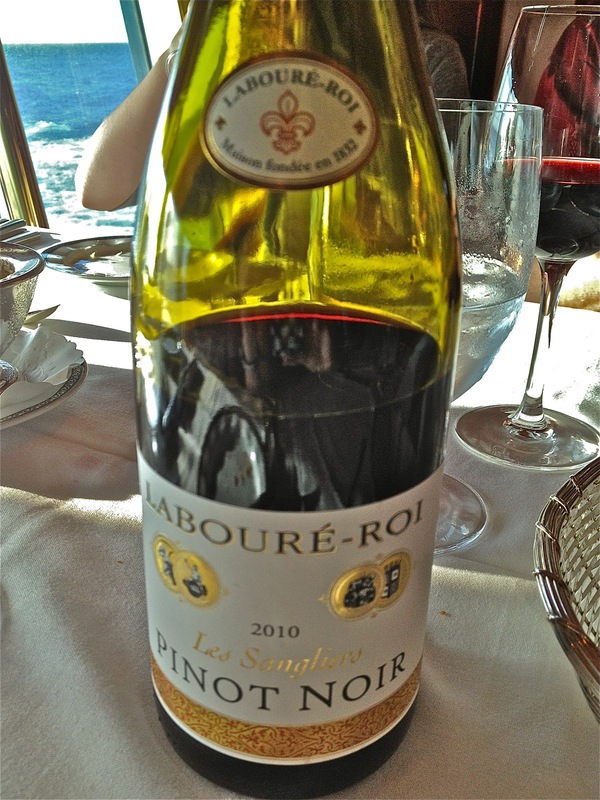 Basically we ordered 5 bottles of wine up front and drank them throughout the cruise. It was less expensive this way and we could have them at any meal or in the room. We just told them what bottle we wanted and it appeared. Cheers to that! So, UK readers, does that look like an English breakfast? 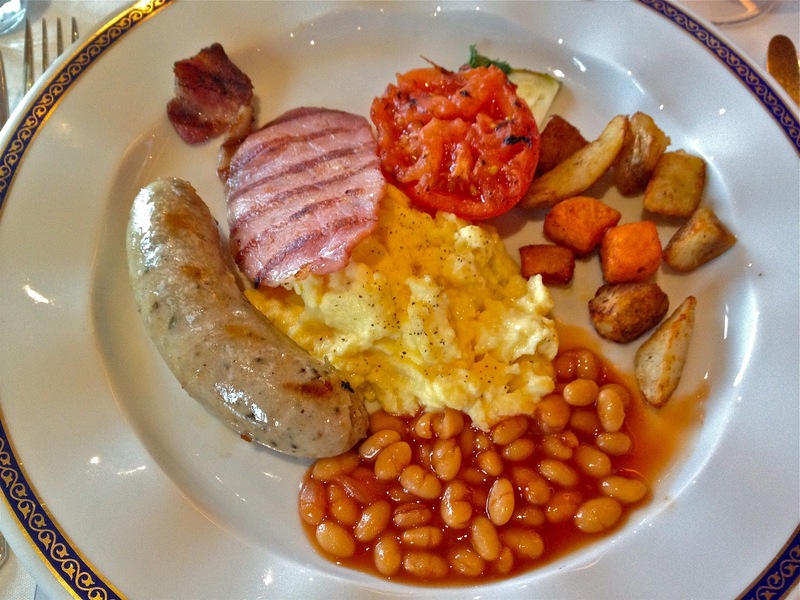 The breakfast in the main dining room had several selections from other countries including Japanese, Dutch, Scandinavian and this English breakfast that I tried. Overall, I was very pleased with the food on our Caribbean Cruise. 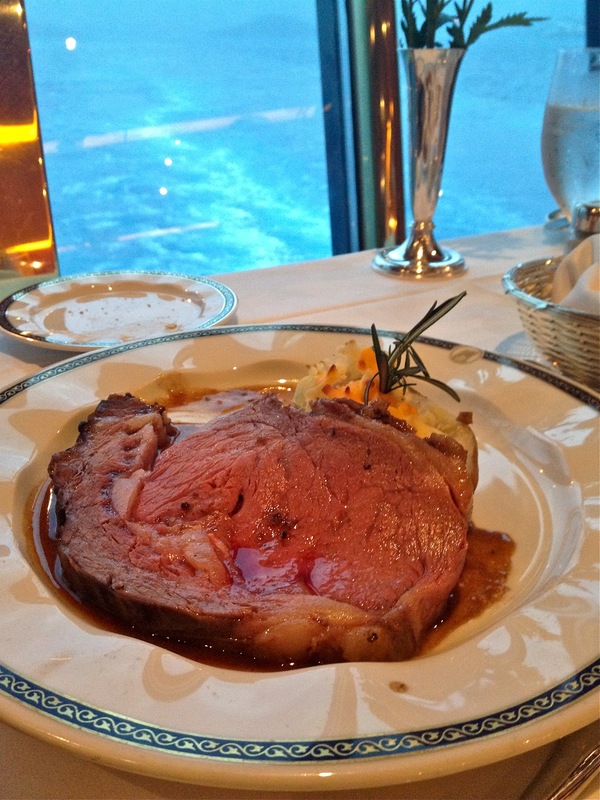 If you have ever been on a cruise, did you enjoy the food selection? What was your favorite? 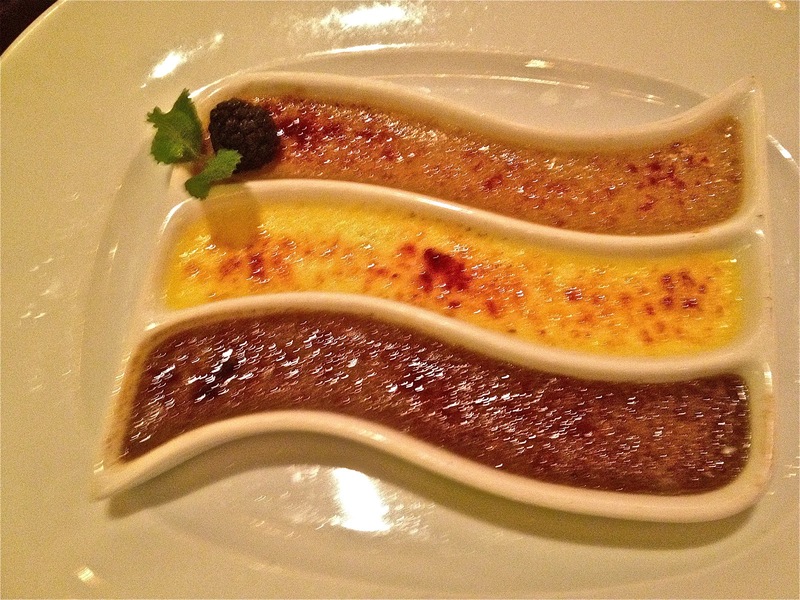 Cruises are a lot of fun…and not just for the food! Oh me oh my! All of this food looks delish! Have fun! It was! The entire family really enjoyed it! Love these cruising food photos! I love looking forward to going to the Lido and seeing what they have especially the desserts. 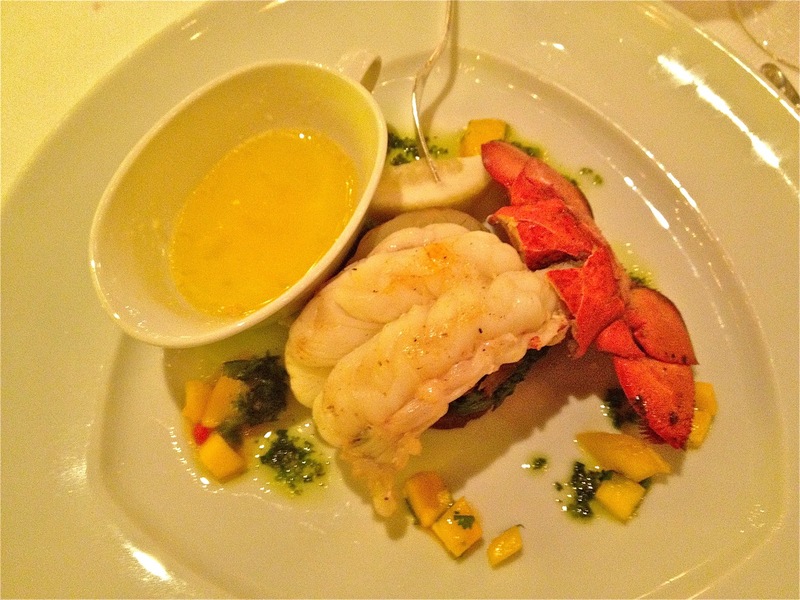 Great selection of dinner food and of course, the lobster 🙂 We have been on several cruises and sailed on Holland America twice and their food is one of the better options among the other cruise lines. Yes, the next cruise we take, I will get more Lido photos. I felt like I was taking lots of pictures, but when I got home, it didn't seem like enough. That is good to know about the food on different cruises. We have only been on Holland America, so I have nothing to compare it to. But I do think it is great! Super yum! They all look so good! All of this food looks amazing! I can totally relate to the correlation between food and travel. Scoping out new restaurants is one of our favorites things to do on vacation as well! It's fun, isn't it? The only bad thing is when you pick something that you don't like. I always feel like I wasted a good opportunity to find some new great thing. All of that food looks amazing! It sounds like you had a wonderful cruise! Yes, that looks like a proper English breakfast to me! The food looks huge and heavenly. We are also fans of Pinot Noir wine. Good choice! My favorite Pinot is La Crema. Have you ever had that one?